This year Fedor is to meet one of the most famous fighters from New Zealand Mark Hunt. Mark Hunt is 32 (he was born on the 23rd of March of 1974). He is 178 cm tall, 127 kg weight. This sportsman’s style is kickboxing. During his PRIDE fights Mark Hunt has won for 5 times and has lost only for 2. Fedor is two years junior of his opponent (he is 30). His height is 183 cm and his weight is 102 kg. He’s won 14 victories in his PRIDE fights. It’s worth reminding that last year Mark Hunt was successful at K-1 version fights and became Grand Pri champion of 2001. During his PRIDE fights Mark has won over such famous sportsmen as Mirko Krokop and Vanderley Silva. These facts can promise a exciting show for fans. Besides our champion New Year tournament will also present Josh Barnett, Antonio Rodrigo Nogueira, Mauricio Shogun and a lot of other fighters. As for Fedor the real alarm can be caused only by his injury: he broke his toe during evening training on the 11th of December. After this his tournament presence was really questionable. But the sportsman proved again that you can try conclusions with the Russian fighters but not for will-power! And now today he is going to Japan with his coach. Before the flight we could talk to Fedor and ask him about his mood for the journey and his plans for next year. We found out that during the journey he will be not just with the coaches but with close friends (from Stariy Oscol, Moscow, Kislovodsk and even from Holland), and what is the most important with his wife and daughter. So he will celebrate New Year’s Eve as it is customary in Russia with the closest for him people! First of all he plans to start building a house in 2007. It will be built according to the newest technologies with glued beam – firm enough and ecologically clean hardware. As a future master of the house Fedor was satisfied with the offered project. – The house will have three levels – says Fedor – ground floor will have three sport rooms, one of them will be playing room with ping-pong and billiard tables. There will be a bath-house – and of course it will be different building. We can’t make without a garage for the car and a recreation zone with a summerhouse and barbecue place… All in all the project really inspired me and now I wish to build my dream house as soon as possible, to make a garden… and live in such a cozy place with a big friendly family. Next year Fedor will have some travels as well. In the middle of January he will visit Korea where he will not only fight as an honorable guest in one of the tournaments but will also act for commercial. It is also possible that he will take part as a fighter in one of the February tournaments of Mixed combat in New York. And then long-expected for Russian fans sports show “Russia vs. USA” will take place. First the tournament was planned for March bur now it is possible that the tournament will be postponed for April. So this is all for the closest future prospects. 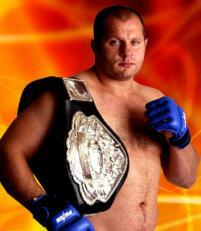 We wish Fedor a traditional Good Luck and also note that the best gift for our fighter’s fans will be his VICTORY!